"Plans to protect air and water, wilderness and wildlife, are in fact plans to protect man." Stuart Udall. 1962 - (Photos) Rotenone Green River. Halverson. 1996 - Organic Drift In Regulated Desert River. Shannon. 1997 - Habitat Relationships Humpback Chub. Converse. 1998 - Geomorphology and Endangered Fish Habitats of Upper Colorado River. Vansteeter. 1999 - Razorback Sucker Movement Canyonlands. 1999 - Response Benthose Organic Drift Controlled Flood. Blinn. 2000 - Reservoir River Linkages Colorado River. Benenati. 2000 - Spatiotemporal Variation Humpback Chub. Meretsky. 2003 - Analysis Of Recovery Plan Implementation For Threntened And Endangered Fish Gila Basin. Desert Fishes Team. 2003 - Status Report Listed Arizona Fishes Gila Basin With Recommendations. Desert Fishes Team. 2004 - MLFF failure. Korman. 2005 - Predatory Fish Removal Colorado River. Mueller. 2011 - Ecosystem Ecology Meets Adaptive Management Food Web Response Controlled Flood Glen Canyon. 2011. 2013 - USGS Fact Sheet. Kennedy. 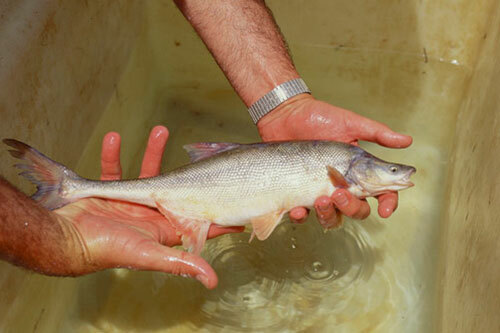 2013 - Status Report Listed Arizona Fishes Gila Basin With Recommendations. Desert Fishes Team. 2013 - Food Web Dynamics In A Large River Discontinuum. Cross. 2014 - Conservation To Stem Imminent Extinction: The Fight To Save Razorback Sucker In Lake Mojave. Marsh. 2015 - Mercury Selenium Accumulation Colorado River Food Web Grand Canyon. Walters.